(Bailey) Pequin Peppers are less than 1/2″ wide and less than 1″ long and 10 times hotter than jalapenos. They turn from green to orange to red when ripe. They are slightly oblong and rather on the warm side, around 97,000 SHU. The plant grows upright and is semi-determinate. The fruit can be found high in the canopy and will fall off of the stem when mature. 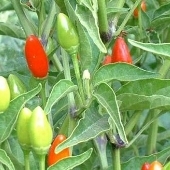 Bailey Pequin Peppers were developed specifically for machine harvest by New Mexico State University in 1991. Outstanding Features: This variety was developed for machine harvesting.